I would like to thank the students, vendors and staff of Stitches East 2014 for an amazing show. It seemed that I was busy every minute, either teaching, visiting or signing books (sometimes all at once! ), so I may not have properly expressed by gratitude and appreciation at the time. My classes were all full or over-full – with delightful knitters who formed instant communities and worked with me to make a great experience for everyone. We had lots of “aha” moments, and fun show-and-tell. The market was amazing, but my schedule was so full that I didn’t get around as much as I would have liked. 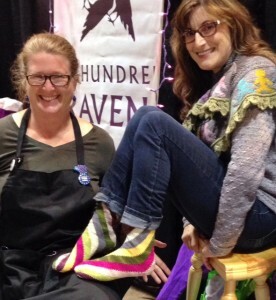 I did visit with my friends at Holiday Yarns and Dizzy Sheep, and connected with Kate at A Hundred Ravens, to plan the Astoria Sock KAL which we plan for November. 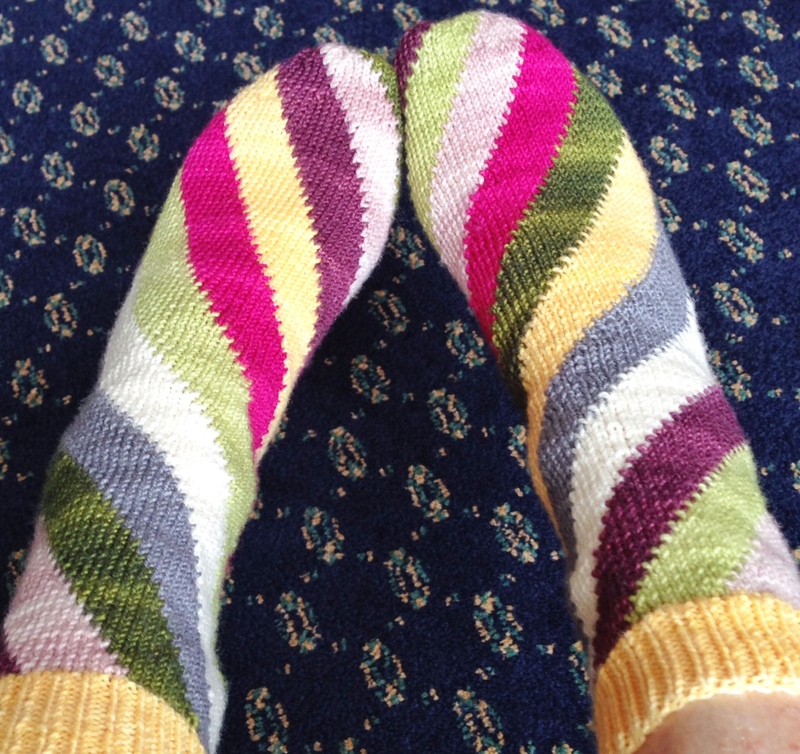 You are going to love this kit with this sock pattern! It was a busy, busy few days – and “Annetarsia Knits” is headed to lots of good homes. 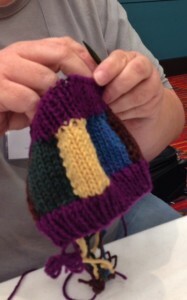 As many knitters as I could teach are ready to try out their new skills and have fun with color. It was a great event and I am already looking forward to next year. Re-united with Sarah Jaworowicz, who book designer for “Annetarsia Knits”. 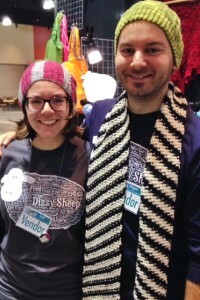 She worked in the Dizzy Sheep/Village Yarn and Fiber booth, and we are posing with Dizzy, who you may recognize from his commentary in pages of the book. Modeling the Astoria socks, knit with the kit Kate is making with A Hundred Ravens mini-skeins. They had a wonderful booth, which was crowded during the entire event. Sarah (wearing the Rose City hat) and Michael (wearing the original Dizzy scarf), staffing the Dizzy booth. One of those t-shirts will be coming home with me to Portland. Aren’t they great? Right off the needles, not blocked but ready to wear. I changed the color sequence for the second sock, so they look different but coordinate. I love them so much! 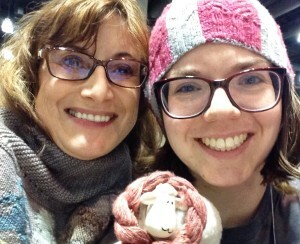 Kate and I plan to launch the KAL in November, so watch for that! 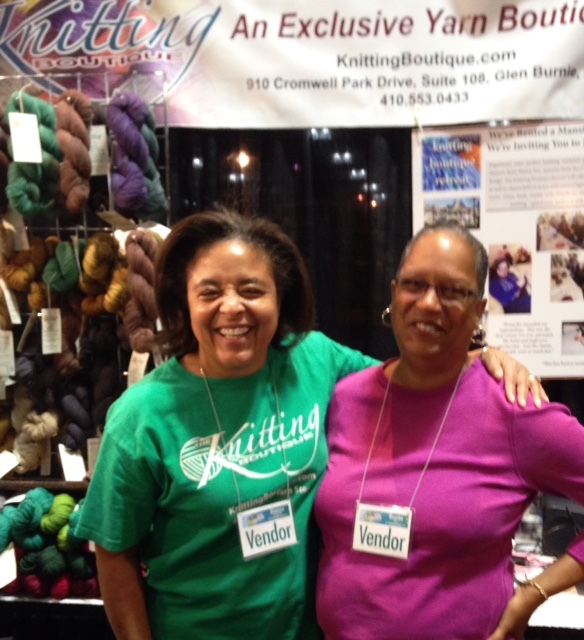 “Annetarsia Knits” was sold in three booths at Stitches East. Here I am signing at Elegant Ewe, and at this signing they sold out of their stock! Fortunately, Yarn Barn of Kansas still had books through Sunday, and I signed them there, as well. I enjoy visiting with the knitters who are taking the book home, the time passes quickly. I am too busy to take photos during classes, so I can’t show you all of the wonderful knitting produced. This knitter was finishing her project as I packed up, so I got a shot. She turned her in-the-round swatch into a headband/ear warmer. Very clever and useful. Good work! 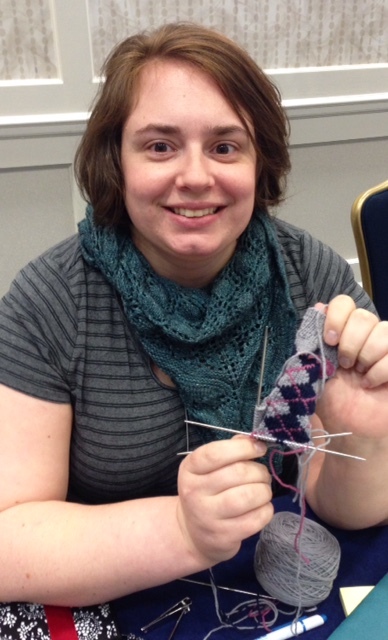 Rebecca, at the end of Argyle sock class, with her adorable mini-sock. We met at the Denver airport when you were knitting a shawl in “ducks” colors. I would like to buy your book from you….that is, an autographed copy. Let me know how to do that. Thanks for writing, Ann! 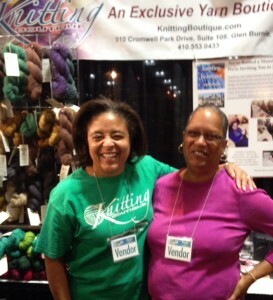 It was so much fun to talk with you, and see your beautiful knitting. I’ll get a book out to you, this week! Have fun.